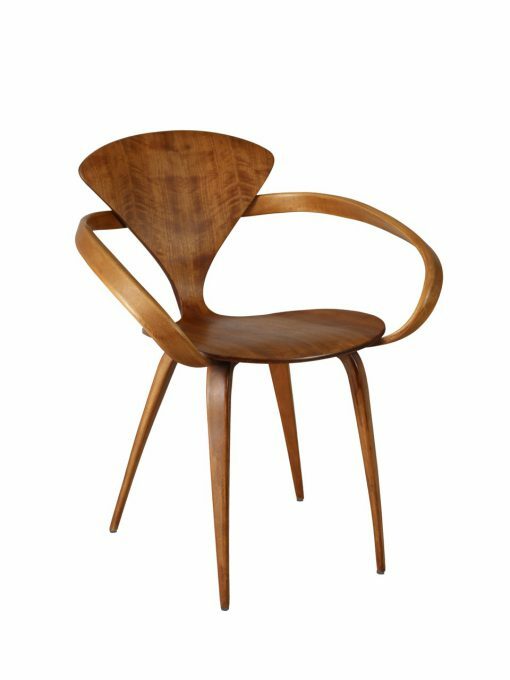 One chair savvy furniture and art collectors snap up as fast as teenagers at a Supreme drop are the early Cherner chairs that dealers like Twentieth Century Marks and Pink Flamingos of 2 Columbia Road bring over from America. Keep your eyes out on stalks for them at our next two shows at The Hepworth Wakefield on 3/4 February and our March show in Dulwich. Head to the show page here. Anyone who owns a Cherner armchair knows the heart-opening feeling it gives you whenever you walk into the room. Hands down the sexiest moulded plywood chair of all time, it resembles a musical note with its sleek curved arms sculpted and steam bent from a length of solid wood and those pointy veneered legs tapering into perspex points. Fans of the chair will instantly spot the ‘Cherner’ Woody climbs onto to talk to Jessie in the villain’s high-rise apartment in “Toy Story II” . But it is that Norman Rockwell image,“The Artist at Work”, with the Saturday Evening Post’s graphics’ man famously captured from behind that made this chair famous back in 1961. The result of the designer’s passion for Bauhaus idealism and low cost construction, this plywood laminated in graduated thicknesses ‘has legs’ as far as collectables go. Simon Andrews, head of C20 Decorative Art and Design at Christies in London dubs it “one of the definitive expressions of American midcentury design, uniting innovative plywood-bending technologies with the Bikini hour-glass silhouette and whiplash styling of 1950s American popular culture”. If its wasp waist and generous curves weren’t enough to make you weak at the knees, the startling story behind the chair only adds to its allure. Imagine Norman Cherner walking past a Manhattan showroom and seeing his axed 1958 design for in all its glory six months after Plycraft founder Paul Goldman had pronounced it too expensive to produce? See him walking into the showroom, turning the chair over and seeing another name under the Plycraft production name. A ridiculous name, a name so fictitious it makes you want to guffaw with laughter. Quite why Goldman, “the father of plywood technology” decided to change the name on the sticker under the chair to that of ‘Bernardo’ and destroy his own reputation in the process is baffling. ‘Bernardo’ might mean ‘brave as a bear’ in Italian but on a Plycraft label it stands for utter greed and foolishness. The brazen producer also occasionally used the nom de plume of ‘Lou App’ on the Cherner chair to include his own Christian name backwards. Cherner was a native of New York so he was bound to see what Goldman had done. This well established architect had written numerous books, won awards and was friends with George Nelson, who recommended Cherner to Goldman in the first place after his own ‘Pretzel chair’ turned out to be too delicate. 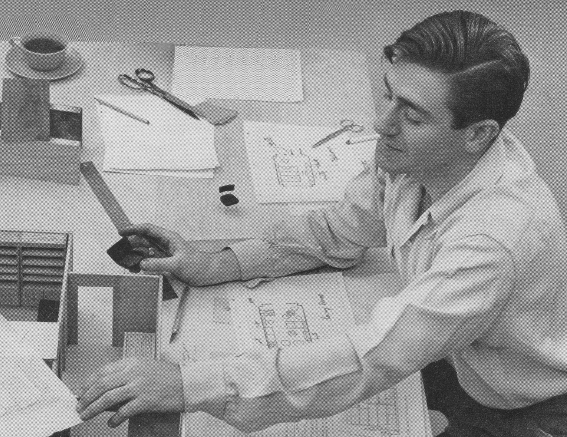 So with Nelson’s witness testament and the original drawings to hand, Cherner Goldman was an open and shut case from the outset with Cherner successfully suing Plycraft for monies owed and a commitment from the devious manufacturer to produce and pay for his design well into the early Seventies. Plycraft went quiet after the factory was destroyed in a fire. But more recently Cherner’s sons Benjamin and Thomas have taken up the mantel after countless requests from architects and interior designers. Benjamin Cherner remembers his father as, “always drawing, the sketches that he routinely threw away were effortless and beautiful. He hated clutter and the houses he designed for us never had basements or attics, just like the house I recently designed for my family. “ Ben and Tom formed The Cherner Chair Company in 1999 and now distribute moulded plywood chairs, stools and tables worldwide in all manner of wood finishes and leather detailing reissued from the original drawings and moulds.